How many times have you heard that or said it yourself? No single recipe epitomizes everything people love and fear about French cuisine more fully than hollandaise sauce, a luscious emulsion of egg yolks and butter flavored with a little lemon juice. A properly made hollandaise sauce is sophisticated, perfectly balancing acidity and richness.Its satiny texture transforms simple foods such as steamed vegetables and poached fish into voluptuous indulgences. Hollandaise is heavenly to eat, but tricky to make: heat it a little too much and you end up with a curdled mess; add the butter too quickly and the sauce separates into pools of butterfat and sour liquid. Hollandaise should not be kept warm for extended periods (especially these days when salmonella is so common in eggs) and thus is best prepared right before it is served. Many cooks, including those of us who are otherwise confident about using classical French techniques, have found ourselves frantically trying to reconstitute a broken sauce or making a second batch from scratch while guests kill time drinking too much wine. Other cooks simply rule out hollandaise as a recipe too fussy or too intimidating to try in the first place. Not to worry. 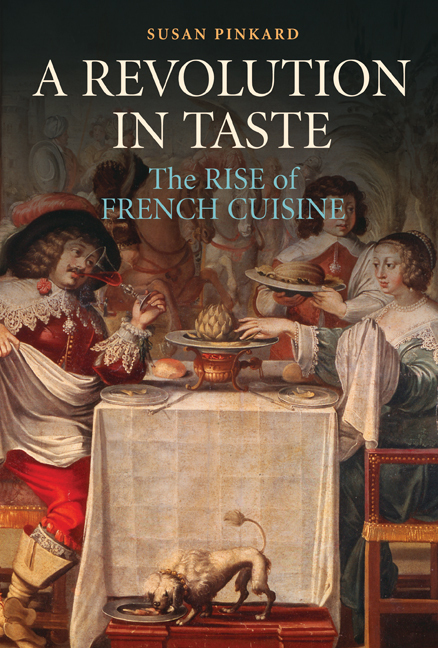 Hollandaise itself descends directly from one of the oldest and most celebrated recipes in the history of French cuisine and, in its original form, it is not nearly as intimidating as cooks now find it. We’ll get to that, but first a bit of history. n 1651, a cook who took the nom-de-plume La Varenne published a recipe for sauce blanche, which consisted of egg yolks emulsified with butter and flavored with salt, pepper, and a little wine vinegar. Sauce blanche was revolutionary because it was meant to envelop each morsel of food with a luscious cloak that accented its natural taste (fats tend to magnify the flavors with which they are served).The sauces that had been popular in medieval and Renaissance cooking (in France and throughout Europe) were spicy and sweet or sweet sour, a souvenir of the cuisine inherited from ancient Rome and from the Islamic civilization that had dominated the Mediterranean world in the Middle Ages.These spicy sauces were meant to balance the dietary composition of the foods they accompanied and, from an aesthetic point of view, to emphasize deeply layered flavors that fused together in a manner that made their components difficult to identify, even by people with sensitive palates. 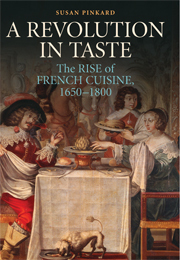 From both the scientific and aesthetic perspective, sauce blanche broke new ground—its purpose was to underscore rather than mask the natural and authentic character of vegetables, fish, and other fine foodstuffs. Sauce blanche was one of the fundamentals of the new French cuisine in the delicate style, which was driven by the variety and quality of fine principal ingredients rather than complicated seasonings. La Varenne made his sauce blanche on a potager, a waist-high countertop built of brick that was pierced by four to six round openings that were heated from below by fires of varying intensities.The potager was a novel item of kitchen equipment in seventeenth-century France and it represented a huge advance over cooking in the fireplace, the default option in previous centuries.On a potager, pots and pans were positioned at a convenient height for stirring, skimming, and turning as well as constant observation of the cooking process.If the contents of a pan became too hot, it could be lifted off the burner for a minute or two, lowering the temperature and averting disaster.Without this rudimentary ability to control temperature, the delicate recipes that were hallmarks of the new French style of cooking (including emulsified sauces such as sauce blanche) would have been impossible to imagine, let alone to make. That said, the cook’s ability to control the heat source of the potager was only approximate.The double boiler—a piece of equipment that buffers fragile mixtures from high temperatures by setting them over simmering water and which is routinely recommended in recipes for hollandaise today—was not yet in use.Although La Varenne did specify the use of a bain marie (a large pan of hot water in which a saucepan was partly submerged) in some of his recipes, he did not recommend it for making sauce blanche.Thus the question:if we twenty-first century cooks have trouble making hollandaise and other emulsified sauces on our modern stovetops with their minute temperature controls, how did La Varenne manage to do so on a potager? The answer lies in the method La Varenne specified in his recipe for sauce blanche, which differs in its fundamentals from the technique recommended in almost all modern cookbooks.The modern version seems to have been invented in the 1820s by the famous chef Antonin Carême, who cooked for such luminaries as Prince Talleyrand and the Rothschild family.These more recent recipes for emulsified sauces call for cookingtwo to six egg yolks with a small quantity of acidic liquid (lemon juice for hollandaise, a reduction of white wine vinegar flavored with tarragon for béarnaise sauce, and so on) until the yolks start to thicken.Then up to half a pound of butter is whisked into the warm egg yolk mixture. Some recipes call for melted clarified butter, others for butter at room temperature, but in either case it must be added in miniscule amounts, so that it can be fully absorbed by the egg yolks in a creamy and increasingly dense suspension. La Varenne’s technique is much easier to execute and in my experience it is virtually foolproof. When a film of melting butter appears in the bottom of the pan, add 2 beaten egg yolks.Stir constantly as the butter melts and is absorbed by the slowly warming egg yolks. Resist the temptation to raise the heat to speed things up—this is the only point on which you can go wrong. If you would like a very buttery sauce (which La Varenne recommends) add up to half a stick of additional butter in increments of a tablespoon each and beat until smoothly incorporated and the sauce is as thick as you would like it to be. Depending on the size and type of pan you use and the setting of your burners, the sauce should be ready in 10 minutes or so. That’s it:you’re done. The reason why this simple technique works so reliably is that the egg yolks warm to the thickening point very slowly, cushioned by the pool of liquid formed by the melting butter. The butterfat, liberated drop by drop from its solid form, combines in a smooth liaison with the egg proteins, creating the characteristic satiny texture of a well made emulsified sauce. The simultaneous cooking of the egg yolks and melting of the butter minimizes the risk of producing a curdled or separated sauce. (For an excellent explanation of the chemistry of emulsified sauces see Harold McGee’s book The Curious Cook: More Kitchen Science and Lore). 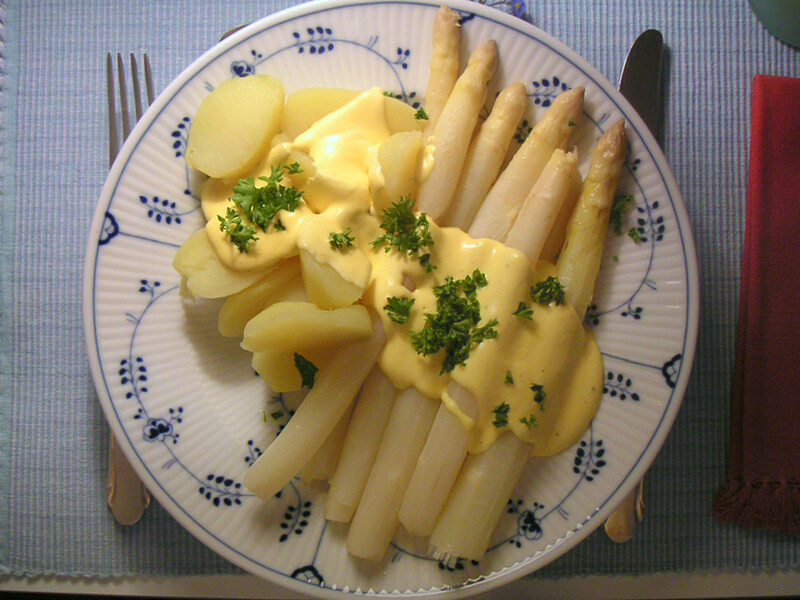 La Varenne’s technique, developed to cope with the limitations of the seventeenth-century potager, gives us moderns welcome insurance when we make hollandaise and other emulsified sauces in today’s kitchens. Sometimes the old way really is the best.